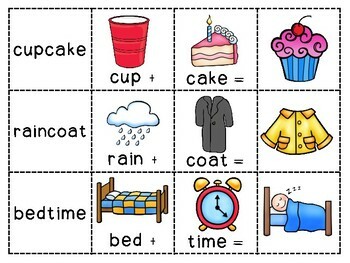 Looking for easy prep literacy activities for independent work during differentiated reading instruction? Look no further! 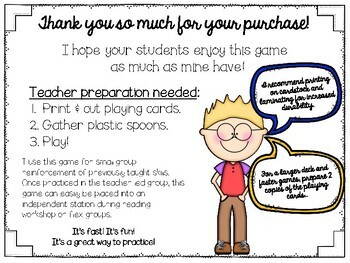 This highly engaging Spoons card game will have your students reinforcing reading skills and having a blast! Kids love the fast paced competition! Teachers love the ease of preparation! Just print, laminate, and cut. Games store easily in bags, boxes, or envelopes. Spoons not included. This game addresses standard 2L4d. 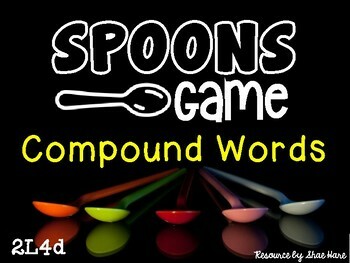 The game cards include a concept card with a written compound word, an image for the compound word, and a card for each of the words that make up the compound word. 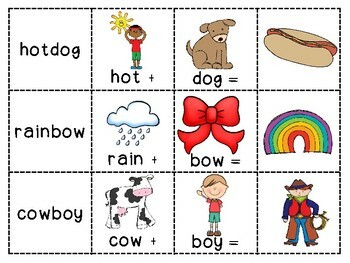 See the thumbnail for examples. Check out my store for other Spoons Games!